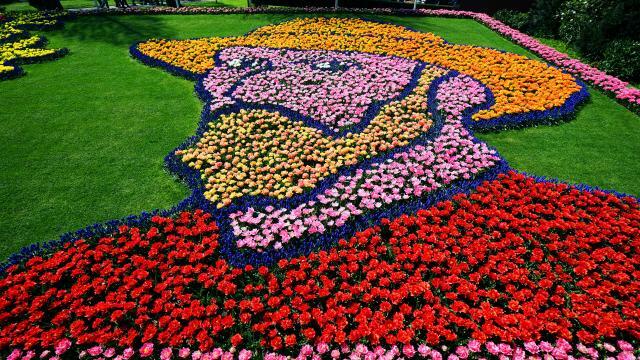 Keukenhof Gardens is really a collection of smaller planned gardens and exhibits as opposed to one huge endless field of flowers. In the previous article, Keukenhof Map & Pavilions, the various exhibit halls and building were described. This article will focus on the outdoor garden areas that will make up Keukenhof 2018 Romance in Flowers. There is one historical garden and eight inspirational gardens, each with its own theme. The historical garden is a fascinating place and makes an excellent early stop on a trip to Keukenhof. Some of the bulbs have been cultivated for nearly 400 years and there is a recreation of the original Holland tulip garden. If you are interested in the history of tulips, the historical garden is the place for you. Keukenhof, and all gardens, are meant to inspire. Built on the inspirations of the grower, gardens seek to invoke emotions within the viewer. Whether those emotions learn towards romance, family, joy, sadness, or inspiration itself, the result is the visitor taking a stroll through his/her own memories and feelings as much as any stroll through a garden. Decked out in a Valentinian theme, the red and white flowers of Cupid’s Garden will be the home of lovers old and new. Snatching a quick kiss under the Kissing Gate is sure to make one of the more romantic selfies of 2018. Perhaps this is the place to find love for those who have lost it or have yet to find it. Dutch are NICE people. Really GREAT at building small WALLS. Was told people first voted against small dikes. Told them lots of small dikes voted AGAINST me too. AMERICA 1st! I can only imagine how much Delft tableware will be sold on account of this garden, but if you would like a picture in the most Dutchy of Dutch flower gardens, the Delft Blue Garden is probably a good bet. The Health Garden promotes the mental and thereby physical health of people that visit them. Particularly when in urban areas and the space for gardens is limited. The Health Garden tries to show that even a small garden can bring a sense of peace and tranquility to busy places. I’m not entirely sure that the Dutch have a firm handle on the word Hipster based on the description of this garden. The Hipster Garden is described as an outdoor man cave. A place meant for the heartiest of men to meet, chop wood, hunt deer by strangling them, and then cooking up said strangled deer for dinner. Where a hipster with his armored laptop backpack, bicycle, and one pant leg rolled up fits into this garden, other than to be strangled if the hairy men can’t find a suitable deer, I’m not sure. But if you are a hipster I would beware of large men with axes in this garden. If you were a fanb of Love Boat, the classic 70’s-80’s TV show, this may be the garden for you. Blue skies, open seas, palm trees, sun & fun. The Holiday Romance Garden is about meeting that lover while away on holiday for a tryst that looms in the memory forever….I’m getting a bit misty eyed thinking about it. Now I know why Gopher was always drunk at the bar. The Rebl Garden could be a recipe for disaster. Billed as the place where anything and everything is permitted, it would seem to be a place where a nation of extremely tolerant people look the other way. You can already smoke marijuana and select which pretty girl in the window you would like to dally with, so what is going on in The Rebel Garden almost belies imagination. Don’t be surprised if you see a dwarf dressed in leather walking a goat, also dressed in leather, while holding hands with a 6’ man in a large furry bunny costume asking for directions to the Rebel Garden. Keukenhof is a park for you to enjoy, but you can also gain inspiration for your own home and garden. Rob Verlinden will once again create a special garden for Keukenhof in 2018. Rob Verlinden will bring his magic green fingers and eye for arrangement to Keukenhof again in 2018 in the appropriately named Rob’s Garden. A perennial favorite in a place of perennials, a visit to Rob’s Garden is always worth the time. One of the easiest and simplest types of garden is a Tea Garden. With so many types of tea leaves, you can grow an endless variety of flavors and bouquets while never straying away from the humble tea plant. There is no more sense of home than brewing a cup of tea from your own tea garden and that is the concept that the Tea Garden hopes to foster among the gardeners in all of us.